Yes, you CAN homeschool gifted kids! In fact, you can do it quite well since homeschooling affords you the wonderful opportunity to meet unique needs perfectly. While each family’s situation certainly requires homeschooling to be tailored to specific needs, there are some very common trials that parents face in teaching gifted students that I’d like to tackle today. What do I do when my child devours every curriculum I provide? How will I homeschool well when my child knows more than I do? How is it possible that my child is gifted AND struggles in some areas academically? How can I deal with the intense emotions of my gifted child? While we could chat over a cup of tea on any one of these topics for quite some time, I’ll give you seven quick and relatively simple tips to help you move on from the fears and homeschool well. 1. Let the curriculum be devoured. If your child is happy to devour curriculum and you have the means to purchase more, by all means do so. You can do this in a variety of ways. For example, you can simply buy the next level in whatever curriculum you’re currently using. Or as another example, you can find a different curriculum that may teach similar concepts in a new way with different types of assignments. If you don’t care to spend more money or you have another reason for holding back on the next level (like maturity of the material), you can always encourage books, documentaries, field trips, and other non-curriculum options to devour instead. You’ll be surprised at how much “additional” learning your gifted child can find for him/herself when given a little freedom (and sometimes a nudge) to do so. 2. Encourage depth and breadth. Let’s say your child finished an entire chapter of the history book in an hour – and based on the teacher’s guide that chapter should have taken a couple of weeks to get through. Now is your child’s chance to shine as you expect him/her to dig deeper, go further, and become an expert on the topic…then PROVE to you their expertise through some kind of project. In our home, we call this project-based learning. The concept is simple. Your child can go to any variety of sources to learn more about something from the chapter that was intriguing. Once enough new information is gathered to be considered an “expert”, your child can complete any number of projects to showcase the knowledge. The projects can certainly be tailored to whatever strengths and interests your child has. For instance, if your child loves making movies, he/she can make a movie clip to present the information. Or, if your child is a prolific writer, he/she can write a newspaper article to share the information. Not only does project-based learning help your child hang out a little while longer rather than just devouring curriculum, it provides a great opportunity to take ownership of learning and work in ways that spark joy and creativity. Sometimes, gifted kids just keep devouring curriculum and get ahead of our understanding of a particular subject pretty quickly. In this case, I always seek out teachers who can take over. This can be as simple as taking a field trip so the resident expert can field my child’s questions without skipping a beat. Or, we might join a co-op/class/group/camp with teachers and others who have a knack for a certain subject. Online or in-person, single mentors or groups, free or paid (sometimes dearly) – I am EVER-SO-THANKFUL for the people who have stepped into my children’s lives and taken them one (or twenty) steps further than I ever could have. 4. Be okay with incongruent strengths. I’m not sure I’ve met a gifted kid (or adult) yet who doesn’t have some incongruent strengths and weaknesses. Some will be reading on a high school level and completing math on a 1st grade level. Some will be masterful musicians, but throw tantrums well into their teens. Not all incongruencies have to be quite so drastic, of course. In fact, gifted or not, everyone has strengths and weaknesses…and that’s ok.
I’ve always tried to be frank with my children and let them know (kindly) where strengths and weaknesses are. It gives us a chance to celebrate the strengths and work together on strategies to build the weaknesses. When children take ownership of the weaknesses, it’s much easier to get them to be “all in” on whatever steps we take to overcome them. One way I’ve found to overcome weaknesses – whether academic, functional, or emotional – is the practice of brain training. That’s a simple little phrase to encompass physical exercises and game-like activities that build neurons and strengthen executive functioning skills. Brain training is a FOR SURE tactic I use when dealing with intense behaviors, perfectionist tendencies, and anxieties that often accompany giftedness. The exercises and games go a LONG way in ordering the brain so that logical thinking about behaviors and emotions win in the end. I’ve never been one to over-excuse the intensities of my children. Not that I’m insensitive at all! However, I’ve made it my mission as a mom to help my children understand that good character trumps acting out based on feelings. While it’s okay to have certain feelings, it’s not okay to do anything we want with those feelings. So, a good dose of discipline goes alongside a generous dose of understanding. Working on strategies for dealing with the intensities is a must, too. 7. Get help when necessary. There may come a time when academic struggles, learning disabilities, and/or emotional intensities require a little more intervention. Never be afraid to ask for professional help from a doctor or therapist. Catching and working on these issues earlier than later will provide your child with the best chance to completely overcome them for the future! I sure hope these seven tips will help you homeschool gifted kids with more confidence. 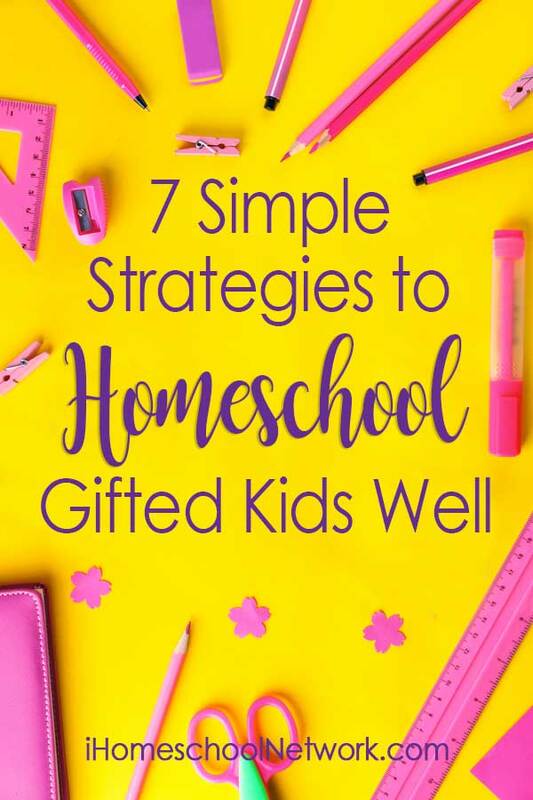 If you’d like to dig deeper on meeting the academic needs of your gifted student, I’d be overjoyed for you to read Homeschooling Gifted Kids: A Practical Guide to Educate and Motivate Your Advanced Learners. In the book, I have shared all sorts of teaching strategies for gifted, creative, struggling, bored, and overzealous students. If you read it, I would LOVE to hear what you think!